Hundreds of volunteers worked with archaeologists from the University of Oxford to excavate the site of a medieval nunnery, and have even uncovered a small group of prehistoric worked flints, including a beautiful Bronze Age arrowhead which is about 4000 years old. Archeox (the Archaeology of East Oxford Community Project) has been working on the site of Littlemore Priory, a nunnery established in twelfth century, for just over a month. Hundreds of people have participated in the dig or visited an open day and several local school groups have been involved. The project included over 500 registered volunteers, was completed last weekend. Project director Dr David Griffiths of Oxford University’s Department for Continuing Education said, “The area we are exploring is part of the site occupied by Littlemore Priory, a nunnery established in around AD1110, which was closed down by Cardinal Wolsey in 1525 after accusations were made that the nuns were involved in scandalous practices. Part of the nunnery buildings (dating to the 1400s) later became a farmhouse and still stand as the Priory Pub (a well-known hostelry next to the Kassam/Oxford United Football Stadium). “Our excavations have revealed stone walls, floors and hearths which show that the priory buildings were once much more extensive, and included domestic, kitchen and workshop areas. We have also found evidence of peat layers which tell the story of the landscape over a much longer timescale. 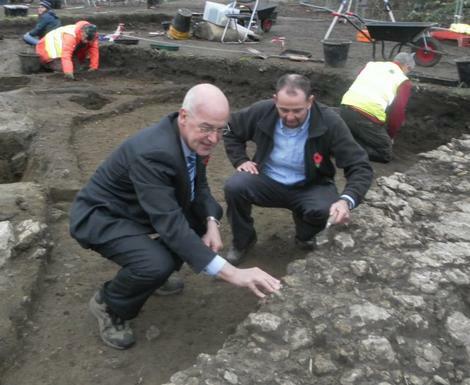 Archeox is hosted by Oxford University Department for Continuing Education and supported by the Heritage Lottery Fund.